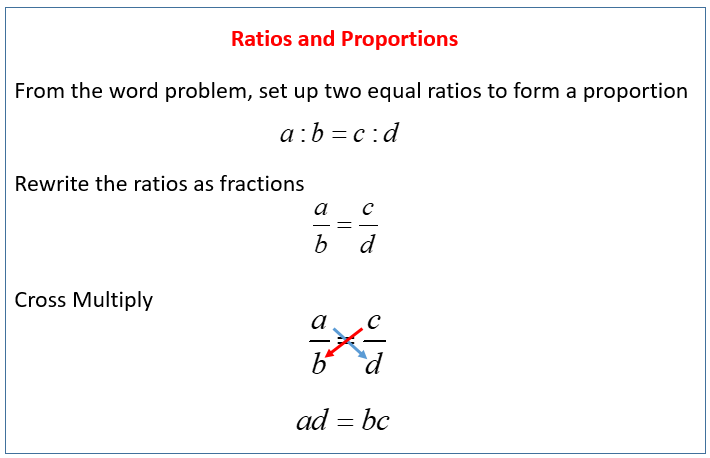 The following diagram gives the steps to solve ratios and direct proportion word problems. Scroll down the page for examples and step by step solutions. Two values x and y are directly proportional to each other when the ratio x : y or is a constant (i.e. always remains the same). This would mean that x and y will either increase together or decrease together by an amount that would not change the ratio. Knowing that the ratio does not change allows you to form an equation to find the value of an unknown variable. If two pencils cost $1.50, how many pencils can you buy with $9.00? The number of pencils is directly proportional to the cost. How to solve directly proportional questions? Example 1: F is directly proportional to x. When F is 6, x is 4. Find the value of F when x is 5. Example 2: A is directly proportional to the square of B. When A is 10, B is 2. Find the value of A when B is 3. How to use direct proportion? How to Solve Word Problems using Proportions? 1. A recipe uses 5 cups of flour for every 2 cups of sugar. If I want to make a recipe using 8 cups of flour, how much sugar do I use? 2. A syrup is made by dissolving 2 cups of sugar in 2/3 cups of boiling water. How many cups of sugar should be used for 2 cups of boiling water? 3. A school buys 8 gallons of juice for 100 kids. how many gallons do they need for 175 kids? 1. On a map, two cities are 2 5/8 inches apart. If 3/8 inches on the map represents 25 miles, how far apart are the cities (in miles)? Two values x and y are inversely proportional to each other when their product xy is a constant (always remains the same). This means that when x increases y will decrease, and vice versa, by an amount such that xy remains the same. It takes 4 men 6 hours to repair a road. How long will it take 8 men to do the job if they work at the same rate? The number of men is inversely proportional to the time taken to do the job. Let t be the time taken for the 8 men to finish the job. Usually, you will be able to decide from the question whether the values are directly proportional or inversely proportional. How to solve inverse proportion questions? Example 2: F is inversely proportional to the square of x. When A is 20, B is 3. Find the value of F when x is 5. How to use inverse proportion to work out problems? How to use a more advanced form of inverse proportion where the use of square numbers is involved. How to solve Inverse Proportion Math Problems on pressure and volume? In math, an inverse proportion is when an increase in one quantity results in a decrease in another quantity. This video will show how to solve an inverse proportion math problem. Example: The pressure in a piston is 2.0 atm at 25°C and the volume is 4.0L. If the pressure is increased to 6.0 atm at the same temperature, what will be the volume?